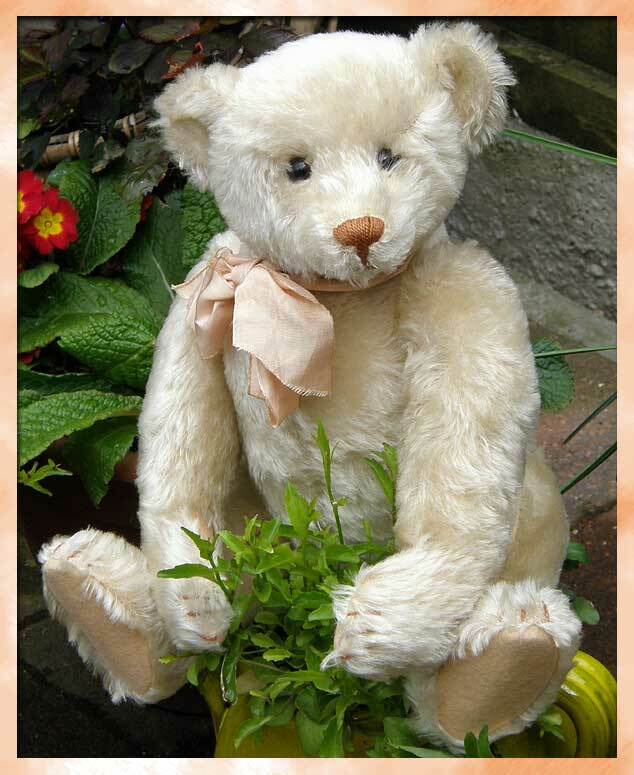 The most MINT early Steiff bear we ever offered for sale!! We are not exaggerating when we say this bear looks like he was just purchased from a department store and yet he is an incredible 114 years old! The most store-new bear we ever had the pleasure of offering for sale, complete with his ORIGINAL ribbon and teeny tiny blank button - this is a fantastic 16" tall WHITE WHITE 5-claw Steiff bear made in early 1905 and known as a "Baerle 35PAB" ("Baerle" is an affectionate term to use towards someone special or much loved - the name "Teddy Bear" wasn't yet used!). These new-look soft-filled cute looking bears with stitched noses rather than sealing wax and with a colourful neck ribbon were the ones which totally thrilled Margaret Steiff - because she was never very happy with the "clumsy" look of a rod bear. Baerle 35PAB (PAB stands for pluesh, angescheibt and beweglich - plush, disc-jointed and moveable) dates very precisely to early 1905. After this very short period, all bears were made with 4 claws and a larger blank button was used, followed by the FF button. We can surely understand why Margaret Steiff was so thrilled when Richard Steiff designed this incredible, sweet-faced, soft "NEW LOOK" bear which was later to become the "teddy bear" - what a face! This stunning bear has come directly from the granddaughter of the original owner and nobody was ever allowed to play with it - hence the mint condition it remains in to this day!